I’m not inclined to eat any food with “garden” in its name. That’s why I never bothered to try SunChips Garden Salsa. The picture of the tomato on the front of the bag didn’t help. Well, I recently took a risk and gave them a try and all I can say is “what took me so long? !” They are far better than the other two SunChips varieties that I have had – Original and Harvest Cheddar (I don’t recall ever trying the French Onion ones . . . ). SunChips Garden Salsa have a unique, vibrant flavor that is heavy on tomatoes, but have lots of other flavors going on too. They are also supposed to also have the taste of “fresh-picked” jalapeño peppers, but I didn’t detect much of this. They are definitely zesty, but don’t really have any meaningful heat. I’m really glad that I finally tried these chips. Just don’t expect me to start eating salads anytime soon. Pepsi 1893 Original Cola, despite what the advertising says, is not a “totally unexpected cola experience.” Don’t get me wrong–it’s a fine tasting cola. It may even be one of the best I’ve tasted. But it’s still just a cola. Pepsi describes is at “boldly blended,” but I didn’t think there was anything bold about the flavor. It had a very smooth, drinkable flavor, actually. And that “touch of aromatic bitters” that is supposedly includes? They must have accidentally left it out of the can that I drank. “But,” the folks at Pepsi would say to me, 1893 is made with ‘sparkling water’.” Huh? Isn’t this just carbonated water, the same thing that’s in every other soft drink? 1893 probably deserves a “Good” rating, but I’m knocking it down a notch because it’s not nearly as revolutionary as Pepsi wants you to think it is. Don’t believe the hype. I bought a bag of Doritos Mix Cheese Explosion recently and was not impressed. I can’t recommend it to Phoood readers. But, I can recommend the bag that may be sitting right next to it on your supermarket shelf – Doritos Mix Taco Explosion. It’s made with spicy nacho triangle tortilla chips, taco-flavored rolled tortilla chips, salsa-flavored 3D triangle doodads, and sour cream-flavored spirals thingies. It’s a nice combination of flavors and the four different shapes make it much more enjoyable to eat compared to just tortilla chips. The flavors aren’t anything new or groundbreaking, just the usual Doritos’ flavors that I’ve come to love. And that’s just fine with me. I've enjoyed eating at On The Border (a.k.a. On The Border Mexican Grill & Cantina or On The Border Mexican Café) for many years. For a chain restaurant, I think it's pretty decent. I wish there were more of them where I live, and less Chevys. Not long ago, I started seeing three varieties of On The Border tortilla chips in the supermarket. I bought a bag of the “Café Style” chips to see how they would compare to my current favorite tortilla chip, Calidad Restaurant Style (if you haven't tried these, you really should). The On the Border chips have a great flavor and just the kind of texture I like in a tortilla chip. They're much better than just about every other brand of tortilla chip you'll find in a supermarket. In fact, I like them about as much as my revered Calidad chips. The On The Border chips are a little more expensive than the Calidad chips, so I will probably only buy them when they are on sale. But, it's nice to have another quality tortilla chip option when shopping. Taco Bell may just be my favorite fast food restaurant these days. Not because of anything having to do with the food, the menu, or the service. No, it's all because of the Taco Bell mobile app. The app makes food customization, ordering, and payment as easy as tapping on my phone's screen. I love that I can peruse the menu without annoying the people in line behind me, or the Taco Bell employee who is standing there, tapping their foot as they wait for me to choose between the Cheesy Gordita Crunch or the Doritos Cheesy Gordita Crunch. I can take as long as I want. I can also customize the menu items – add black beans, bacon, and chipotle sauce to a Beefy Fritos Burrito, and have the burrito grilled, for example. I could probably do the same thing without the mobile app, but with the app it's fun to do and the app shows the prices of the extras (some are actually free). Once I have assembled the perfect order, I just tap a couple of buttons and that's it. Because Taco Bell has my credit card number, I don't even have to get out my wallet. At the drive-thru window, they just hand me my food and I drive off like I'm some kind of fast food royalty. The app is well designed, easy to use, and the entire process works smoothly (other than a couple of hiccups the first few times I used the app). The future of fast food is here, and Taco Bell is leading the way. Taco Bell’s Loaded Grillers are some of my favorite items on the menu. I probably buy at least one on every visit. Not only are they a good value, but I love the flavor of the tortilla that results from the grilling process. Taco Bell recently began offering three new “Dare Devil” Loaded Grillers, each more spicy than the next. I recently bought the Fiery Ghost Pepper Griller, the hottest of the three, to see just how hot Taco Bell is willing to go. In addition to seasoned beef, nacho cheese, and crispy tortilla strips, it includes a “fiery ghost pepper sauce.” Ghost peppers are some of the hottest chili peppers in the world, and the Fiery Ghost Pepper Griller is undoubtedly the hottest fast food I have ever eaten. Unless you really like extreme heat, you should stay away from it. On the other hand, if you are like me and enjoy eating food so hot that it feels like your tongue is being squeezed in a vise, give it a try. Just don’t be surprised if the heat isn’t as great as you think it could (or should) be, or if the heat fades much faster than you expect. I applaud Taco Bell for pushing the envelope and offering an item with real heat. I just wish they would have taken it a bit further on the Scoville scale. I’m not sure how long Berry Creme Oreo Cookies have been around, but I saw them on the shelf at Safeway recently and bought a bag. Of course, I’m a big fan of Oreos, and not just the original chocolate wafers-with-white-creme-filling ones. There are many Oreo varieties that are delicious. Now, I’m adding Berry Creme Oreos to this list. The cookies are great, perhaps the best Oreo I’ve ever eaten. From the picture on the front of the bag, it appears that the folks at Oreo were going for a raspberry/strawberry flavor. I can’t say for sure that this is the flavor of the berry filling. All I know is that I love how it tastes. Give me a stack of these cookies and a big glass of cold milk and I’m in Oreo bliss. Definitely Phoood approved! The ingenious folks at Doritos have created a very tasty “tortilla snack” that is kind of like a tortilla chip, but not. The roughly triangle-shaped Doritos Jacked 3D snacks taste like tortilla chips, but are about half the size and are several times thicker. Their intricate shape and their thickness result in one very crunchy snack. They have such a substantial crunch that as I ate them, my jaws actually ached a bit. No joke. Even though I may have been risking a Temporomandibular Joint Disorder, I kept on eating them because I liked their flavor. The combination of jalapeno and pepper jack cheese flavors work well together. It’s a relatively mild jalapeno flavor, without too much heat. Well, unless you eat a lot of them over a short amount of time, like I did. Then, you might find yourself needing a cold glass of milk to cool things down. As much as I like the Jalapeno Pepper Jack snacks, I wish that I could buy them in Nacho Cheese, Spicy Nacho, or Spicy Sweet Chili flavors, because I think I would like them even more. If you have become bored with the seasoned tortilla chips you have been eating forever and want something a bit more daring, Doritos Jacked 3D Jalapeno Pepper Jack are definitely worth trying. I should have known better. I should have known that what I saw in the television commercial wouldn’t look anything like what I actually received when I bought it. It’s happened so many times before. But, the Taco Bell Triple Steak Stack looked so full of steak and so delicious in the commercial that I let myself believe it was possible. Reality hit me hard as I opened up the wrapper to eat the Triple Steak Stack. It wasn’t filled with an inch-deep layer of juicy steak. There weren’t pieces of steak nearly falling out of it because it was stuffed so full. No, not even close. I had to lift up the top of the flatbread to make sure there was even any steak in there. There was, but much fewer and smaller pieces than I had expected. Many of the initial bites I took when eating the Triple Steak Stack resulted in only a mouthful of flatbread and cheese. At least the flatbread tasted pretty good. By the time I started getting to the steak, it was too late. My dream of plentiful steak had been shattered. Taking into consideration the price of the Triple Steak Stack and the modest amount of steak in it, I can’t recommend it to Phoood’s readers. I’ve been eating at Carl’s Jr. for many years, and I never considered that the burger I was eating wasn’t natural. Turns out, evidently, I have been eating unnatural burgers. I say this because Carl’s Jr. has introduced the All-Natural Burger, which is made from grass-fed, free-range beef with no added hormones, steroids, or antibiotics. Makes you really wonder what is in the “other” beef, huh? So, the All-Natural Burger uses (supposedly) better beef from happy cows that frolic freely in grassy meadows. That’s all fine, but I want my burger to taste good too. The All-Natural Burger does taste good, but not significantly different from their “non-natural” burgers. It wasn’t immediately apparent to me that I was eating a burger made with higher-quality beef. The patty seemed to have a slightly different texture than other Carl's Jr. burgers, but it was pretty subtle. All things considered, there’s no reason not to eat an All-Natural Burger. Just don’t expect it to be all that much different from the other burgers on the Carl’s Jr. menu. I haven’t been impressed with Jack in the Box’s burgers lately. But, they might be getting back on track with the Buttery Jack burgers. I recently ate a Bacon & Swiss Buttery Jack, a burger that was unlike any other fast food burger I have ever had. It looked and tastes more “upscale” than you typically get at Jack in the Box, or other fast food restaurants for that matter. It had a new type of bun that is similar to the fresh-baked buns served at Carl’s Jr., although not quite as tasty. It also had a square patty, a la Wendy’s. The patty was large and thick, and tasted good. But what made the burger so delicious was the melted garlic herb butter that topped the patty. Oh yeah, there’s nothin’ better than butter on a burger! It was a wet, slippery mess, but it sure tasted good. The only thing keeping the Bacon & Swiss Buttery Burger from earning Phoood’s highest rating is the bacon, which was thin, soggy, and seemed like it was merely an afterthought. Why is it that Wendy’s is the only fast food restaurant that does bacon right? Note: It appears that Jack in the Box is only test marketing the Buttery Jack burgers in my area (Sacramento), because they are not shown on their website. Yup, Carl’s at it again - going places that no other large burger chain dares to go. The Texas BBQ Thickburger is a bold combination of hamburger, smoked brisket, BBQ sauce, cheese, fried onions, and fried jalapenos. I made the mistake of eating one of them while driving. Because I could only (safely) use one hand to eat the burger, I couldn't give it the support its large size required. So, I ended up with BBQ sauce-covered brisket on my shirt. Oh well, it was worth it. There was a surprisingly generous amount of brisket on the burger, the BBQ sauce was tasty, and it came on one of those “fresh baked” buns, which are a huge improvement over the regular buns. Some may really like the fried onions and fried jalapenos, but I thought they kind of distracted from the other flavors that were going on. However, they did give the burger some nice crunchiness. I got the ½ pound version of the burger (it’s also available with two smaller patty options) and it was plenty big enough to fill me up. I can easily recommend the Texas BBQ Burger to Phoood readers. Just be sure to eat it with two hands. Get it while you can, as it will likely be on the menu for only a few months. Some things can’t be improved. Milk Chocolate (a.k.a. “regular”) and Peanut M&M’s may be two of those things. I happen to think that Peanut M&M’s are slightly more delicious than the Milk Chocolate ones, but I love them both. Either way, they are about as close to candy perfection as you can get. Much like Pretzel M&M’s, Birthday Cake M&M’s don’t even come close. First, they don’t really have a “cake” flavor. There’s some frosting flavor going on, but that’s about it. They certainly didn’t remind me of birthday cake, only of eating Betty Crocker frosting with my finger out of one of those plastic tubs. Oh, come on. You know you’ve done it too. The other thing wrong with Birthday Cake M&M’s is their size. They are a bit larger than regular M&M’s, with a bigger milk chocolate center. This throws off the ever-important “milk chocolate to candy coating ratio.” Buy a bag of Birthday Cake M&M’s if you must, just to give them a try. I’ll bet, however, that you probably won’t buy them again. This is one of those “how come nobody ever thought of this” products that comes along once in a while. Waffle fries have been around for a long time, but I had never seen waffle chips until I bought a bag of Cape Cod Waffle Cut Chips while shopping at Safeway recently. The chips are delicious, with a great potato flavor and just the right amount of salt. The “double-sliced waffle cut” gives them a unique texture that I love. There’s just something about all those ridges and holes that makes them so enjoyable to eat. They are pretty thick chips that should stand up well to any dip that you want to eat with them. I bough the Sea Salt flavor, but the chips also come in Farm Stand Ranch and Buffalo Cheddar flavors. I figure it’s just a matter of time until other companies come out with their version of waffle chips, but it’s going to be hard to top Cape Cod Waffle Cut Chips. 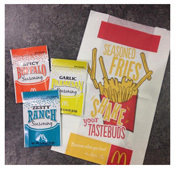 McDonald’s is test marketing new seasoned fries in some of their Northern California restaurants. They’re called Shakin’ Flavor Fries, a apt name because it will be you doing the shaking. That’s right - you get an order of fries in the usual fry container, a paper bag, and a packet of seasoning. Dump your fries in the bag, sprinkle in the seasoning, seal the top of the bag, and shake it. Yeah, I was pretty surprised that I had to prepare my own fast food. First issue: Who at the corporate office thought that customers want to do the seasonin’ and shakin’ themselves? I sure don’t. Second issue: You may not want to use the entire seasoning packet, as I did. If I ever bought Garlic and Parmesan Shakin’ Flavor Fries again (which I won’t), I would start by using half the seasoning packet and add more if needed. Third issue: These are not the “fresh garlic and imported Parmesan cheese” fries you might find at a good restaurant. But, you probably already assumed this. Fourth issue: Worst product in McDonald’s history? Maybe. Taco Bell recently introduced a new breakfast menu to their U.S. restaurants. Eager to see how the menu stacks up against the fast food competition, I visited my neighborhood Taco Bell last Saturday morning and bought a few of the new items. The Hash Brown (very similar to what McDonald’s has been serving forever) was delicious – golden and crispy on the outside, moist and tender on the inside. I could have eaten a stack of them. The Waffle Taco with sausage was a disappointment, mainly because the “waffle” taco shell was dense, chewy, and didn’t taste much like an actual waffle. The third item I bought was an A.M. Crunchwrap with bacon. It’s something that I can see myself ordering again and again. The Crunchwrap is made with scrambled eggs, a hash brown patty, cheddar cheese, bacon, and creamy jalapeño sauce, all wrapped in a flour tortilla, then grilled. The final product is a yummy tortilla pouch of goodness. Sure, I would have liked to have more bacon in it, but that’s really my only quibble. The rest of the ingredients tasted good, the hash brown patty added a nice crunchiness, and the jalapeño sauce spiced the whole thing up a just a little bit. I also really liked that I could eat it with one hand without it falling apart or dripping stuff down my arm. There are several other items on Taco Bell’s breakfast menu, and I’m looking forward to eating some of them … along with an A.M. Crunchwrap. I really liked the last Cheez-It product I reviewed, Cheez-It Zingz, and gave them Phoood’s highest rating. New Cheez-It Grooves deserve an even higher rating, if such a rating existed. The best things about Grooves are their texture and crunch. You can consider Grooves to be either a thin cracker or a thick chip. Either way, Grooves successfully combine the best qualities of a cracker and a chip into a delicious snack. They come in two flavors - Zesty Cheddar Ranch and Sharp White Cheddar. Don’t bother with the former, as it is a poor combination of flavors and lacks any “zest” whatsoever. Sharp White Cheddar, on the other hand, is one of the best flavors the folks at Cheez-It have ever come up with. It’s bold, tangy, and goes wonderfully with the crispy, crunchy cracker/chip. Sharp White Cheddar Grooves are easily the best snack I've tasted this year, and I highly recommend them. The burgers at Jack in the Box seem to being going downhill. First, they started overseasoning them. I no longer crave the Ultimate Cheeseburger because it doesn’t taste nearly as good as it used to. Then, they introduced the worst-tasting burger I’ve eaten in recent memory: the Bacon Insider. The hamburger patty has pieces of bacon mixed in, hence the clever name. In addition to the bacon-infused patty, the burger also includes bacon strips, bacon mayonnaise, American cheese, lettuce, and tomato. It all sounds great in theory, but the Bacon Insider that I ate had a couple things wrong with it. The hamburger patty (which was much smaller that it appears to be in the photo) was seriously overcooked. Maybe it had to be cooked more than usual because of the bacon inside. I don’t know, but the patty was very dry and didn’t have a good flavor. I’ll take their work for it that there were bacon pieces inside the patty. Honestly, it was hard for me to see or taste any bacon in there. To add insult to injury, the burger had what had to be the smallest, thinnest pieces of bacon I’ve ever seen. I could almost see through the bacon strips, they were so thin. That’s the best you can do, Jack? Really? The rest of the burger was … well, it doesn’t matter because my advice is to spend your money on something else. The Bacon Insider is only available for a limited time, thank God. The faster it goes away, the better. The Habit Burger Grill has been around since 1969, but I hadn’t heard of the company until they began opening locations in Northern California a few years ago. The burger I’ve ordered each time I have eaten at the Habit is the Double Charburger with cheese. It’s hard not to compare the Double Charburger to the legendary Double-Double at In-N-Out Burger, as it looks and tastes very similar. Ever since I ate my first Double-Double, it has been my favorite fast-food burger. But, amazingly, I think the Double Charburger with cheese is even better than the Double-Double. The primary reason is because the Double Charburger has larger patties, so you get more delicious meat. 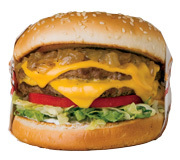 The Double Charburger also has a great char-grilled flavor that the Double-Double lacks. I didn’t think the Double-Double would ever be topped, but it has been. The Habit currently has locations in California, Arizona and Utah. If you are lucky enough to live close to one of their locations, I strongly recommend a visit. 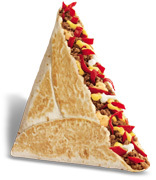 Taco Bell’s new Grilled Stuft Nacho is a great concept – the taste of nachos wrapped up in a grilled, flour tortilla. What better way to eat nachos while driving and not get your shirt messy, right? In reality, the Grilled Stuft Nacho isn’t really made for eating with one hand. Although the triangle-shaped folded tortilla pocket is a novel and tasty idea, it is floppy and I had to use two hands to eat it or I had to fold it in half to minimize the floppiness. When folded, the contents are more prone to escape. Inside of the tortilla pocket you’ll find too much going on: some seasoned beef (not nearly enough, in my opinion), nacho cheese sauce, zesty nacho sauce, reduced-fat sour cream, and tortilla strips. The flavors of these meld together and none of them stand out. There’s too much nacho sauce and sour cream, which may explain the floppiness. The tortilla strips are small and don’t stand up well to the moistness of the other ingredients. They quickly become soggy. Eating the Grilled Stuft Nacho wasn’t anything like eating nachos because there was virtually no crunchiness to it. And isn’t that one of the best things about nachos? On the positive side, the Grilled Stuft Nacho is a decent size (about 7 inches on each side) and only cost $1.29. If you don’t want to spend much and you love nacho cheese sauce and sour cream, it might be just the item for you. Is it possible to make a delicious French fry with 40% less fat and 30% less calories? Maybe it is, but Burger King hasn’t figured it out yet. Don’t they know that fat and calories are what makes French fries so delicious? Burger King’s new Satisfries have the aforementioned reductions in fat and calories, but they don’t taste nearly as good as regular French fries. Satisfries are crinkle-cut fries that may just be the thickest ones I’ve ever seen. The Satisfries that I ate recently were crispy on the outside and moist, the way a good fry should be. The potato flavor was okay. The fries had a lot of salt on them. I’m no saltophobe, but I thought they were a little bit too salty. Sadly, the fries also had a subtle, odd aftertaste. It’s hard to describe the aftertaste that my fries had, other than to say it made me think that there was something artificial about them. Maybe there was an issue with the specific batch of fries that I ate, or something about the oil that they were cooked in. It’s possible, I guess. Giving Burger King the benefit of the doubt, and because the name “Satisfries” is so clever, they earn a “So-so” rating. Recently, Carl’s Jr. began offering fresh baked buns on their Six Dollar Thickburgers. Yes, buns that are baked fresh every day at the restaurant. I recently bought a Super Bacon Six Dollar Thickburger, which features the new bun. The bun looked like it should be on a twenty dollar burger at some highfalutin restaurant that requires reservations. It tasted great and had a sweetness that let you know it wasn’t your typical hamburger bun. It was also substantial enough to hold the rather large burger together to the very last bite. Honestly, the bun was the best part of the burger, and I’m fairly certain I’ve never thought that about any burger I’ve ever eaten. If you want to order something other than a Six Dollar Thickburger, you can get it with a fresh baked bun for an additional charge. You may not think that a bun is that big of a deal, but I think Carl’s Jr.’s fresh baked buns have potential to revolutionize the fast food hamburger. They are that good. I don’t plan on ever eating a regular bun at Carl’s Jr. again. I bought a box of Cracker Jack a while back. The popcorn wasn’t any good and there were maybe 3 peanuts in the box. There are much better coated-popcorn and peanut snacks you can eat, including Crunch ‘n Munch (I ate some of this recently - delicious!). So, stay away from Cracker Jack. Cracker Jack’d, on the other hand, is worth giving a try. Cracker Jack’d is a new line of snack mixes with flavors like Spicy Pizzeria, PB and Chocolate, and Zesty Queso. I bought a bag of the Cheddar BBQ flavor. The three-ounce bag cost two dollars at Walmart, which seems like an okay price considering its ingredients. There are cheddar and barbecue-flavored clusters (oat and/or rice, I believe), peanuts, and hickory smoked almonds. The snack mix has a real good flavor and there’s a decent amount of nuts in it. My only gripe is that toward the end of the bag, there was a lot of loose rolled oats that I felt I had to eat (as I had paid for them…) but didn't taste particularly good by themselves. Cracker Jack’D is marketed as a snack that “fills you up.” I’m not sure exactly who they think a three-ounce bag of snack mix will fill up, but it’s sure not me. I’d have to eat a couple bags to even make a dent in my hunger. But, that goes for most snack foods so I’m not holding it against Cracker Jack’D snacks. Cheez-It Zingz Chipotle Cheddar are yet another addition to the Cheez-It lineup of snack crackers, and this time they hit it out of the ballpark. Zingz are a bit different than the Cheez-Its you are familiar with. They are made with corn masa flour and have a more pronounced crunch than “traditional” Cheez-Its. I really like the texture and crunch that Zingz have. But it’s the flavor of Zingz Chipotle Cheddar that really shines. The flavor is a combination of cheddar cheese, chipotle pepper, coriander, red pepper, cumin, and chili pepper. Despite all the peppers, they really aren’t very spicy. Perhaps what I like best is that the chipotle flavor is very mild, not overpowering like some chipotle-flavored foods are. Typically, I avoid chipotle-flavored snacks because it’s just not one of my favorite flavors. But, I love these crackers. I’ll go so far as to say that they have the best flavor of any Cheez-It product I’ve ever eaten. There have been lots of Cheez-It products that have come and gone - some good and some not so good. I’m hoping that Zingz stay around for a long time, because they are really special. I was very skeptical when I heard that Carl’s Jr. was going to have the Strawberry Pop-Tarts Ice Cream Sandwich on their menu. Even I, who love all things sugar-filled, fattening, and unhealthy, thought that it went a bit too far. Carl’s Jr. is trying too hard with this one, I said. It will be too sweet, I said. The Pop Tarts will fall apart when you try to eat it, I said. But, it was too intriguing just to ignore so I bought one. Honestly, I think it’s one of the most delicious ice cream treats I have ever eaten. The flaky Pop-Tart crust, its semi-fluid strawberry filling, and the hard vanilla ice cream make a delicious and interesting combination of flavors and textures. Surprisingly, it isn’t overly sweet. It’s not big; I could easily eat two of them. But, for most people it will be just the right size and at $1.49 it’s a great value. It gets my highest recommendation and I suggest that you get a couple of them while you can. Subscribe to Phoood by E-mail NEW!